the Inga tribe and a descendant of the ancient Inca. 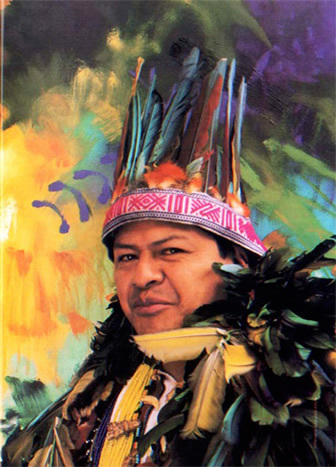 “Carlos Jacanamijoy, the son of a shaman, is the first Colombian artist from an indigenous background to win international recognition. 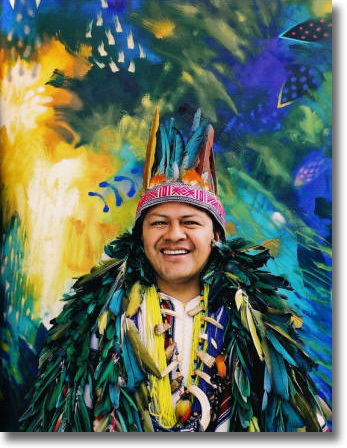 Gifted with an extraordinary skill in the use of oils, his pictures are full of color, reflections, and movement…it is evident that Jacanamijoy’s original works embrace both nature and the heritage of his ancestors…"
"Jaca" was born in Santiago, Putumayo in 1964. 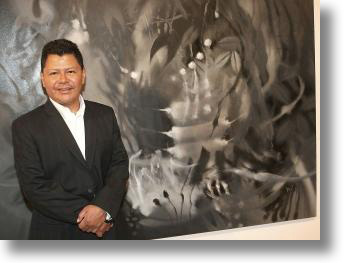 Until he was 18, he grew up in the rainforests along the Amazon River.At the age of 18, "Jaca" left his ancient way of life to study fine art, painting, philosophy and literature from 1983-1990 in Bogota and Cali. 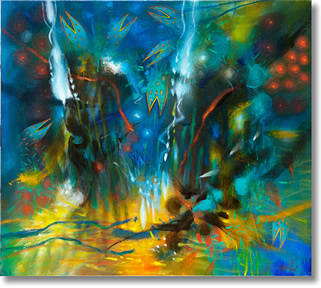 "Jaca's" paintings are portals into another, deeper, more inscrutable world, a world of incredible beauty, magic and mystery. Like American master, Georgia O’Keeffe who took us deep into her floral abstractions, Carlos Jacanamijoy takes us deep into the jungle world of his childhood. 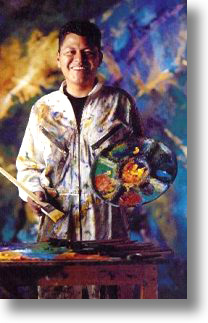 "Carlos Jacanamijoy: Journeys of the Mind"